One man chants, "Squash him! Squash him!" 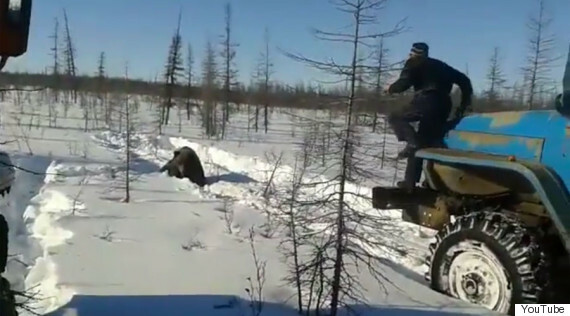 A group of Russian men are being investigated after video appeared online this week showing a bear repeatedly being run over by heavy-duty trucks in the Siberian tundra. 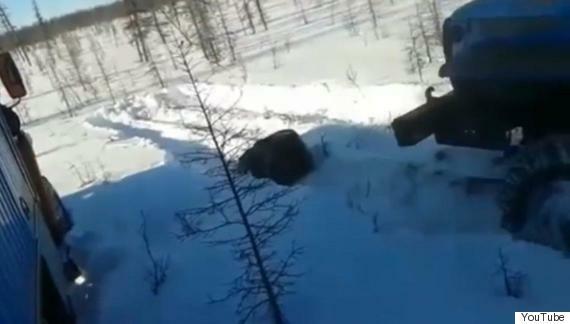 The graphic footage, uploaded to YouTube Monday but since removed, shows off-road trucks chase an exhausted bear through the snow, with a man in the video shouting "Squash him! Squash him!" according to a Agence France-Presse translation. One truck approaches, and the bear, who is unable to run away, eventually disappears underneath the truck's tires. When the truck backs up, the bear is listless. In the next shot, a man is taking photographs of the dead bear. According to The Guardian, the trucks are normally used for Russian oil and mining operations, and Russia's interior ministry spokeswoman Irina Volk said the assailants are local mining workers in Russia's Yakutia region. Investigators said in a statement Wednesday that they have opened a criminal probe on the charges of animal cruelty, reports AP. "We will strive for the most serious punishment for these scoundrels," the minister for natural resources and environment, Sergei Donskoi, wrote on his official Facebook page. "Such crimes should be followed by real prison terms!" Russian news outlet Tass reported that if convicted the workers could face up to a year in prison. On an edited version of the original video, YouTube commenters expressed their disgust and outrage. "As someone who lives in the forest, I find this utterly disgusting! You are spineless F-ing cowards who deserve the same fate you brought upon this animal!" fumed one person. "Cowards, damn cowards," wrote another. "I hope a bear eats each one of them." In 2015, three Russian men were charged in a similar crime, after video appeared online of a brown bear being run over repeatedly by a truck. However, in that video, the angry bear managed to retaliate against the attackers, and the men drove off before the bear was seriously harmed, reports the Daily Star.